We had a huge box of Cornflakes that nobody was eating, so I made Momofuku’s Cornflake Marshmallow Chocolate Chip Cookies. That’s a legitimate excuse right? 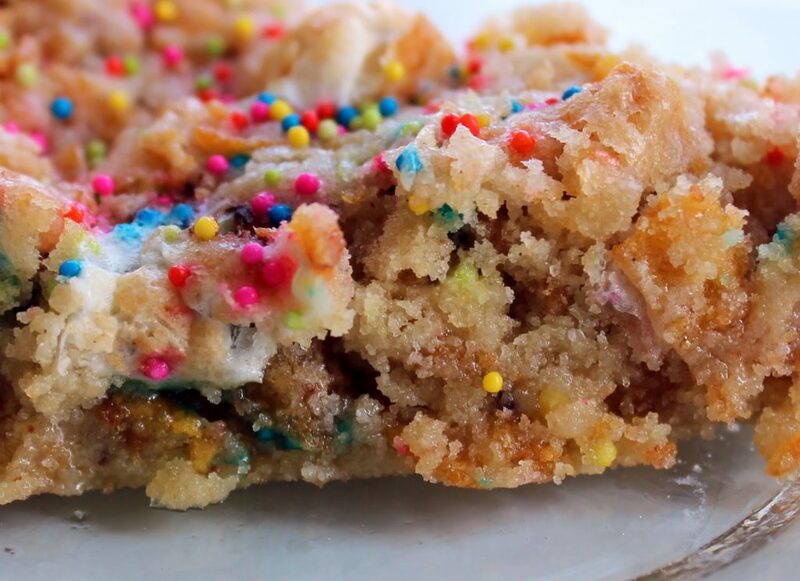 Crunchy and gooey at the same time, delightfully buttery, not too sweet, and a touch salty. These. Are. So. Good. 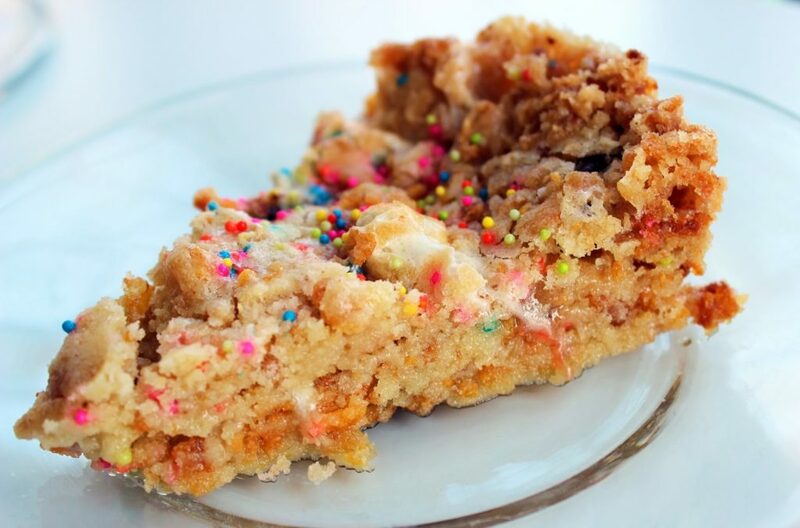 If you haven’t been to Momofuku Milk Bar in Manhattan, you simply must. But of course you can get their cookbook filled with incredible recipes. 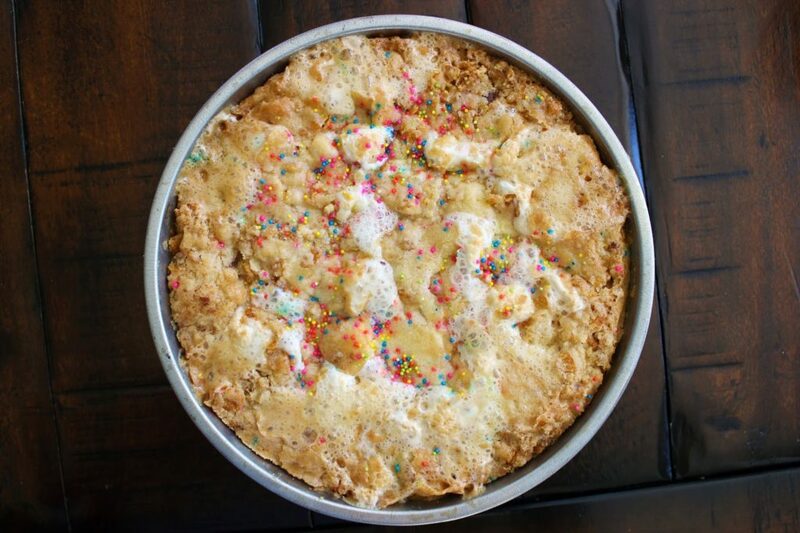 I added sprinkles, because according to 3-year-olds… okay and 30-year-olds, sprinkles make everything taste better! I baked these in a cake pan because for some reason mine always turn out super flat and crunchy when I make them as cookies. Anyone else have this issue? 1. Combine butter and sugars in the bowl of a stand mixer with paddle attachment and cream together on medium-high for 3 minutes. Scrape down bowl and add egg and vanilla. Beat 8 minutes. 2. Reduce mixer to low and add flour, baking powder, baking soda, and salt. Mix until just incorporated- 1 minute. 3. Stir in cornflake crunch chocolate chips, and marshmallows until just incorporated- 30 seconds. 5. Heat oven to 375 degrees. Bake about 20 minutes until the top is golden brown. The middle will be slightly jiggly but that’s okay! Cool completely in the pan before cutting. 2. 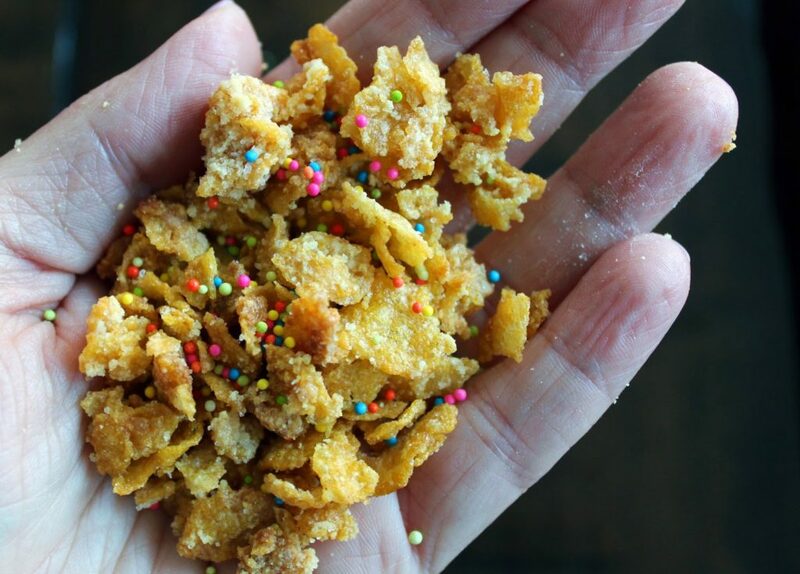 Pour cornflakes in a medium bowl and crush them with your hands to one-quarter of their original size. Add milk powder, sugar, and salt and toss to mix. Add the melted butter and toss to coat. 3. Spread on parchment-lined sheet pan and bake 20 minutes, at which point they should look toasted and smell buttery. 4. Cool completely before storing or using in a recipe. Store in an airtight container and keep in the fridge or freezer to keep fresh for a month for your snacking pleasure! Have a buttery wonderful weekend! A VERY SPECIAL GIVEAWAY: FRESHLY PICKED MOCCASINS – CLOSED!! Leah i have this issue too. The trick, i have found, is to make sure there are no marshmallows on the outside of the mound of cookie dough. And i undercook them by like 6 minutes (recipe says like 18 mins or something outrageous). Next time im trying them this way! These look amazing! I am so hungry!